Welcome to a second unprecedented consecutive TV WEEK here at Daily Billboard (so a TV FORTNIGHT), where the sheer volume of debuting series and returning favourites demands another seven days of new television ad creatives. 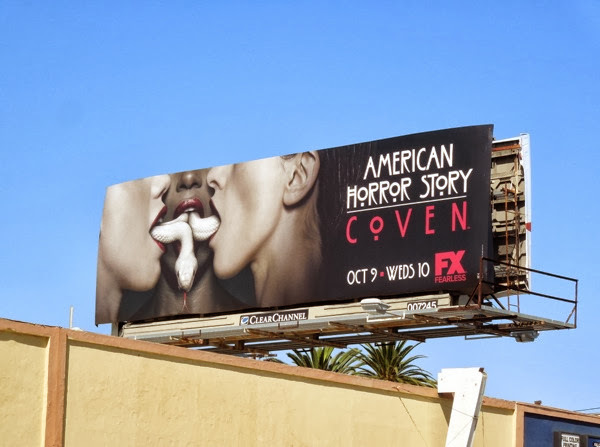 To kick off another thrilling week, here are some stunning new billboards for the third season of American Horror Story, subtitled Coven. The horror anthology has never shied away from the supernatural in the past and this season it looks like it's reinventing itself again to embrace the occult in full force with these surreal and arresting witchcraft and voodoo creatives. This time out it appears the show will focus on its strong female cast even more, which is no surprise as Jessica Lange has almost become the show's creator, Ryan Murphy's, muse over the course of these past three seasons. The Oscar, Golden Globe and Emmy Award winner stars at the powerful 'Supreme' witch in this latest installment. This season the story focuses on 'Miss Robinchaux's Academy for Exceptional Young Ladies', a mysterious school for the magically gifted in New Orleans (which sounds like a grownup mashup of the X-Men's Charles Xavier's School for Gifted Youngsters and Harry Potter's Hogwarts). 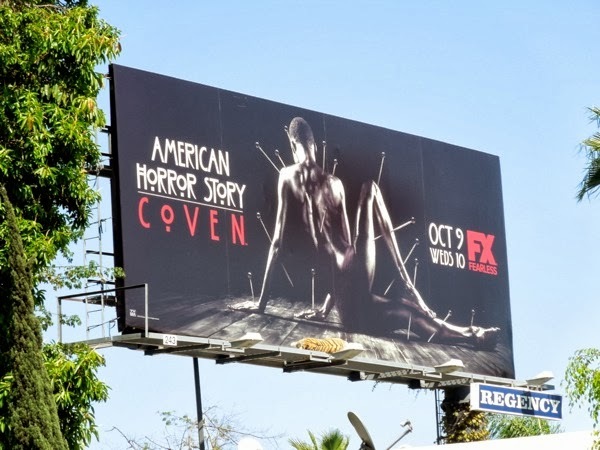 Set in the modern day and the 1830's, Taissa Farmiga returns from the compelling first season as 'Zoe', a girl who discovers she possesses a genetic bloodline leading back to the Salem witch trials. 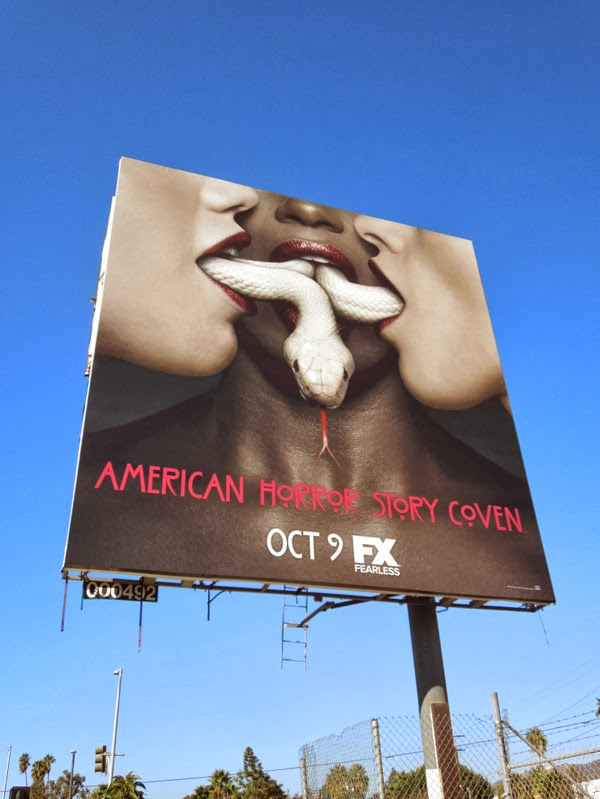 She arrives at the school where Emmy-nominee Sarah Paulson returns as Jessica Lange's daughter and teacher, and meets fellow students played by Gabourey Sidibe, Emma Roberts and the returning Jamie Brewer (who played 'Addie' in season one), where she'll find out the differences between voodoo and witchcraft. 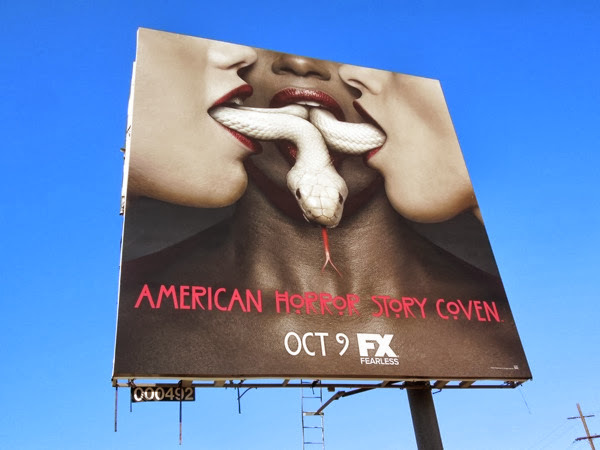 As if that wasn't enough talented actresses, this Coven is joined by two other powerhouses in the form of Kathy Bates and Angela Bassett, and not everyone will be on the same side. Get ready to discover the secret history of witchcraft in America, as dark forces gather and these ladies discover it may not the best time to be a witch. 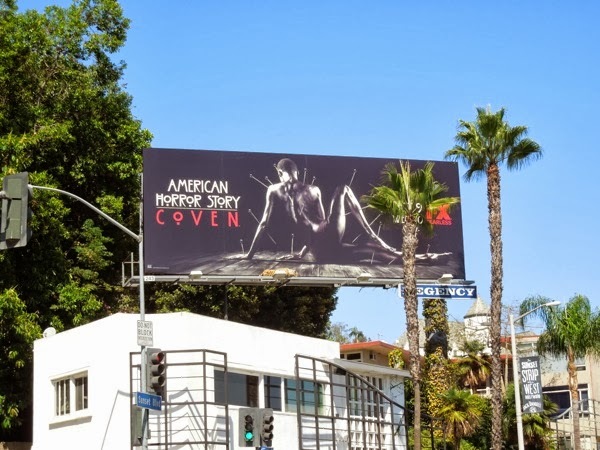 When Daily Billboard first spied the 'human voodoo doll' creative along the Sunset Strip on September 15 we thought it was the perfect image to help promote the spooky new season, but then the 'snake mouth' creative appeared days later on September 18 in the same location and we were blown away again by the equally provocative imagery. 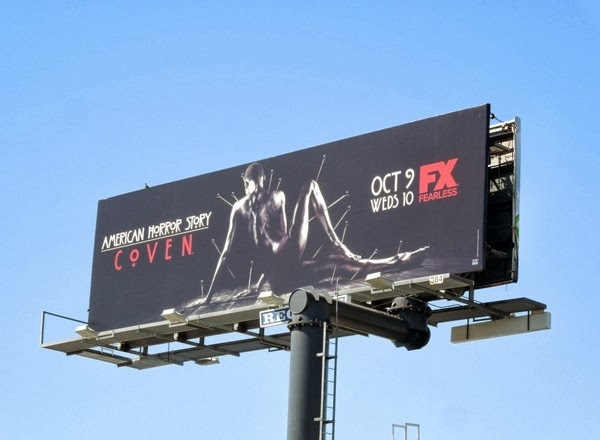 A further voodoo ad for AHS: Coven was spied along Beverly Boulevard that same day too. Apparently in the new season Gabourey Sidibe's character of 'Queenie' plays a human voodoo doll, so how much more fun and spell-binding would it have been to have seen her naked body with voodoo pins sticking out of it. Just a thought FX. 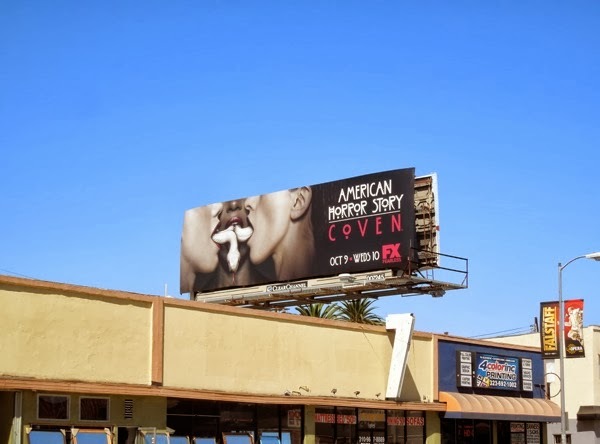 If you're a fan of the supernatural horror series, be sure to check out these American Horror Story season one billboards that started it all in August 2011 and these spooky season two American Horror Story: Asylum billboards, which was an entirely new creepy journey of discovery. 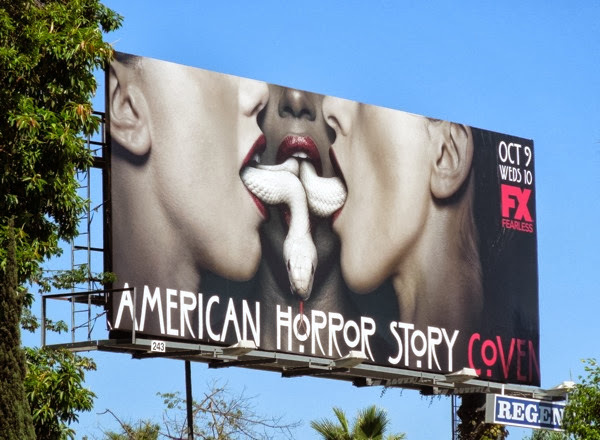 UPDATED: Ads for the new season of American Horror Story are starting to appear all over L.A., so Daily Billboard took the opportunity to get another unobstructed shot of the snake creative, snapped along La Cienega Boulevard on September 26, 2013, which is truly an unforgettable image. UPDATED: This third bewitching season of American Horror Story is turning out to be a truly twisted installment, so Daily Billboard was thrilled to spy this square format ad creative for the show along Fountain Avenue on October 30, 2013. My niece doing her thing! does anyone realize CHILDREN, little girls see these. Are there NO guidelines! 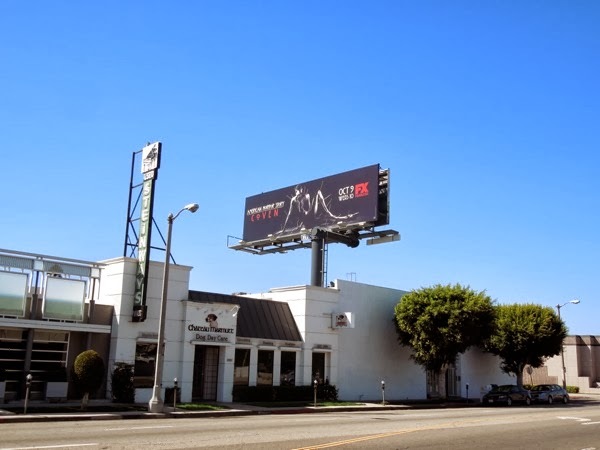 An interesting point, ads like these are designed to be as shocking as possible in order to get as much press, publicity and attention as they can.